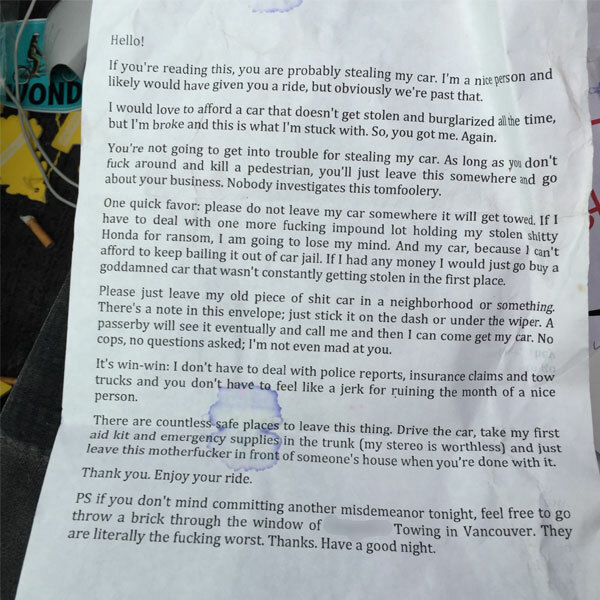 Reddit user mfiasco recently posted a note of a note she left in the glove box of her car, and it’s gone viral on the Internet because of how ridiculous the note is. 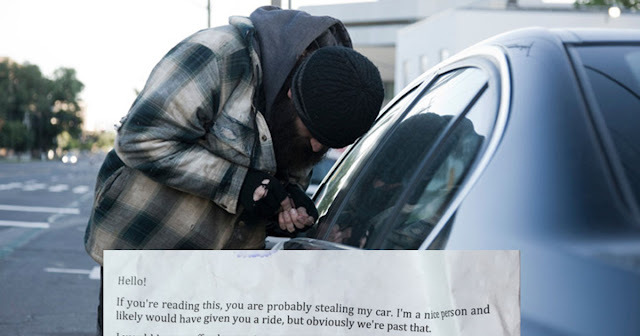 This woman has a common problem – her car always gets stolen, and she knows it. In fact, it gets stolen so frequently that she decided to type up a note and place it in her glovebox in the event it is stolen. The note kindly asks that the thief leave the car in a secure area, preferably in a neighborhood, so that she can retrieve it. She’s had very unfortunate experiences with the towing company, and rather than deal with them, she’s become perfectly okay with a stranger “borrowing” her car. Read below to see what the note says and why it’s going viral on the Internet. If you’re reading this, you are probably stealing my car. I’m a nice person and likely would have given you a ride, but obviously we’re past that. I would love to afford a car that doesn’t get stolen and burglarized all the time, but I’m broke and this is what I’m stuck with. So, you got me. Again. You’re not going to get into trouble for stealing my car. As long as you don’t f**k around and kill a pedestrian, you’ll just leave this somewhere and go about your business. Nobody investigates this tomfoolery. One quick favor: please do not leave my car somewhere it will get towed. If I have to deal with one more f**king impound lot holding my stolen shi**y Honda for ransom, I am going to lose my mind. And my car, because I can’t afford to keep bailing it out of car jail. If I had any money I would just go buy a goddamned car that wasn’t constantly getting stolen in the first place. Please just leave my old piece of sh*t car in a neighborhood or something. There’s a note in this envelope; just stick it on the dash or under the wiper. A passerby will see it eventually and call me and then I can come get my car. No cops, no questions asked; I’m not even mad at you. It’s win-win: I don’t have to deal with police reports, insurance claims, and tow trucks, and you don’t have to feel like a jerk for ruining the month of a nice person. There are countless safe places to leave this thing. Drive the car, take my first aid kit and emergency supplies in the trunk (my stereo is worthless) and just leave this motherf**ker in front of someone’s house when you’re done with it. Thank you. Enjoy your ride. PS if you don’t mind committing another misdemeanor tonight, feel free to go throw a brick through the window of (redacted) Towing in Vancouver. They are literally the f**king worst. Thanks. Have a good night. To clarify, this note has worked.